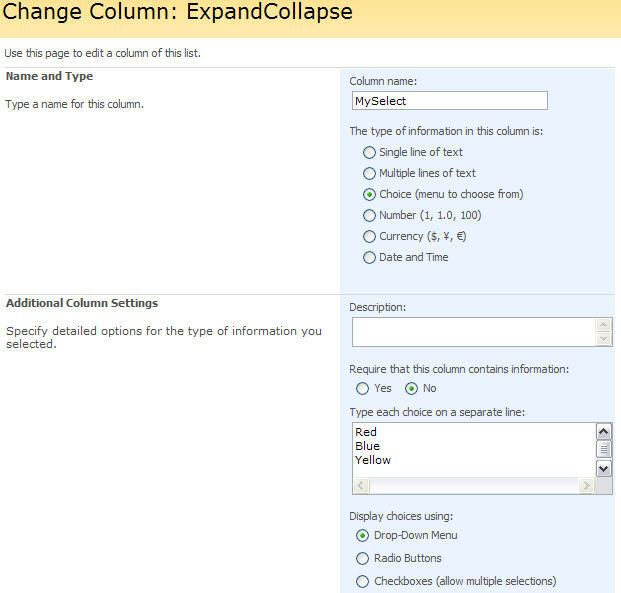 28.11.2009 A follow up article on using multi select checkboxes is found here. This is a short intro on how to dynamically expand or collapse a field or array of fields based upon selection made in another field. This is the only script you need to refer for this example. Pay attention to the FieldNames. Always create names without spaces or special character to get a nice “FieldInternalName” – then you can rename the field to whatever you want – the “FieldInternalName” newer changes! The function “init_fields” is a modified version of the one created by Erucy and posted here. I have modified it to use “FieldInternalName” instead of “DisplayName” for locating the fields. VERY Nice! I am going to play now. I feel like I am always looking on your site. Havent figured out how to make this work off the headers yet, but I started looking into another option. Is there a way to hide/show the fields by userID, or better yet possibly a sharepoint group? I actually use this method myself. I work for Mark Miller at EndUserSharePoint.com. I really enjoyed this article. We would like to cross-post your article. As with other authors, we would publish your entire article on EndUserSharePoint.com giving you full attribution with links. Glad you liked it. You can cross-post it if you like. K, I am nagging about the membership – or not membership in a SharePoint group. No rush of course. why it didnt worked for me? should i change the “ShowIfRed1” to ascii? The names used is “FieldInternalName”, view the source of your page and search for your field’s “DisplayName” and check that your “FieldInternalName” is correct. Can I assume that if I have 30+ questions that each need a dynamic 2nd or 3rd field/question, that this script would get quite lengthy? Well…yes, you would need to write code for all questions. If you have some sort of logic to them – like if you select option number two – you shall always fill inn some sort of additional question, you can make a function which is called on “click” or “change” event on all questions and build your logic in this function. Works fantastic, with one exception.. When creating a new list item, the script works fine. 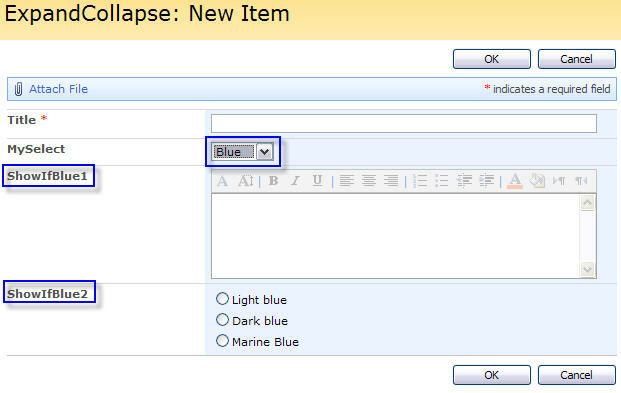 But if you go to edit that item, everything is hidden again until you unselect, and then re-select the filter. It would be nice if when going in to edit the item, the script will read what is already in the dropdown and filter the fields accordingly instead of having to select another choice and re select the original. I originally did this as a short intro only, but have now updated the code to function in EditForm and DispForm as well. to clear the fields in one array or the other when I toggle between the two arrays, but working. Is it the array reference? or the line of code? This approach does not work as $(fields[arrRed]).val(“”) tries to address an array, and not a single field – you must loop trough the array and apply the action to each field. If what you want is to clear the value from the field when collapsing, try to set the input field to “disabled” like this: $(fields[‘FieldInternalName’]).find(‘:input’).attr(“disabled”, true). This should clear the value for most fields, but i am not sure if this approach does the trick for all field types. Can you please elaborate a little more how you can reset (clear) the options in the fields once you toggle between arrays. I’m have trouble getting this to work. Can you please elaborate a little more how you can reset (clear) the options in the fields once you toggle between arrays. I’m having trouble getting this to work. I don’t know why, but the script doesn’t work for me. I tried to follow your example with the fileds “MySelect” “ShowIfRed1” etc.. I created a list with those columns, after that I added a Content Editor Webpart in my newform.aspx, where I added your source code. But… nothing ^^. After that I checked the FieldInternalNames, and they’re the same like the DisplayNames. A common mistake is forgetting to move the CEWP below the list form. I’m glad you liked the script! You find a good solution for setting fields readonly here. You find the solution in the file “fieldutility.js”. Erucy’s solution uses the function init_fields() to locate the fields, but his function uses DisplayName to identify them and not the FieldInternalName as mine does. My function “init_fields” is adapted from his original one, but you will have to replace his function in the file with the one used in the above script. If your Chinese is a little rusty, run it trough Google Translate – you can upload the file and get a full translation (not perfect, but absolutely readable). If you use some of the script examples – pull them from the original file and not from the translated version. Note that the function “init_fields()” from the “fieldutility.js” needs to be replaced with the one from the code above (to shift the identifier from DisplayName to FieldInternalName). How would you need to amend the code in order to make this work if you have different drop down fields hiding and showing a different field for each drop down? 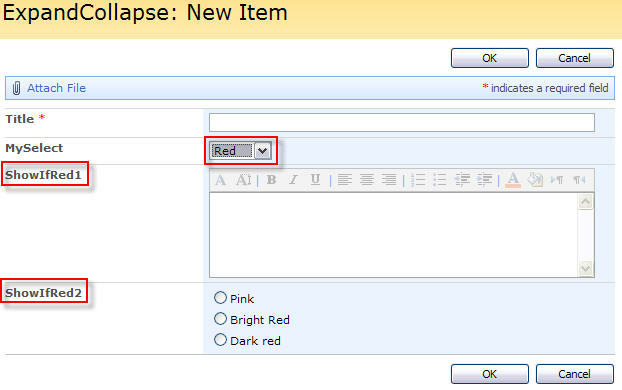 In line 13-21 i have added a function to the click-event on the dropdown, and a onload-call to the function to deal with the selection when the page loads (either EditForm or NewForm on refresh by form validation). 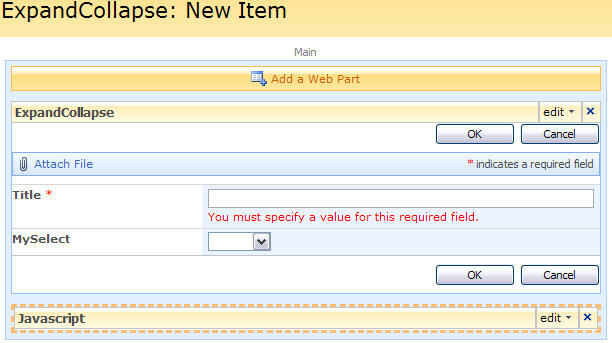 In this code i have specified the FieldInternalName (MySelect) of my dropdown. This code has to be duplicated x-number of times to adapt to your fields. Alternative you could make some sort of looping function (to avoid duplicating the code) – depending on the names of your fields. Arrays of the fields to hide must also be made. Ask again if you do not get it right. Thanks Alexander I have tried duplicating the code you mentioned but each of the drop down fields unhide the same field. I want each of the drop down fields to unhide a specific field. This code is tested in a list containing two drop-downs with FieldInternalName “MyFirstDropDown” and “MySecondDropDown”. The choises in these drop-downs are “Yes” and “No”. I have two additional fields (not important what type), named “MyFirstField” and “MySecondField”. This code shows the corresponding field if the drop-down’s value is “Yes”, and hides it if it is anything else (blank or “No”). // Show the array if the value is "Yes"
That’s great that is just what I was after. Could you also provide the above code for the DispForm also please? I have updated the comment above to include the DispForm code as well. Awesome scripts and support! So now.. How do I get this to work with custom list form controls? It seems to only work on the default list form control. My use case – I need a custom “New” list form control that has hidden fields that are pulling data from some string variables for a parent child relationship and some DVWPs. I have that part. But if I use this code on a custom list form it wont hide the feilds… Help!!! I think you will find the answer in a comment in this post. Can you please provide an example of this for this form? I tried to give the ifreds and ifblues, id’s and call it on in the code and I couldnt get it to work. Thank you so much for your time Alexander!!! See if this article answers your question, ask again if not. Beautiful genius!!!! It took me a bit to figure out that I had to change the “fields = init_fields();” to “fields = init_fields_CustomForm();” but after I did that it works like a charm! Thank you for all the awesome work, please keep it up! 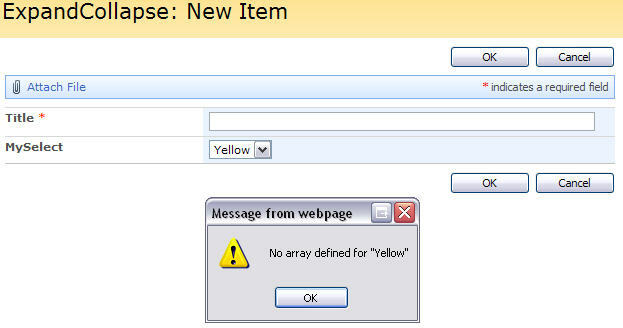 i also tried to insert alert($); and i think that the jquery is not loaded. there is a field “date” in my newform and i want to add days to the current date depending on the value of a dropdown list. How do you create the script to work if you have one drop down field that shows a field based on yes and no and another drop down that shows a number of fields depending on a numbers (1,2,3,4,etc)? You would have to add another function like “dynamicDisplay”, and add the logic on the selected numbers rather than the colors. You must also add the “Onload” and the “Onclick” to the choice-field. Reuse the ones in the example, just replace the function name to point to your new function. Great Post just ike your Blog. But i have just one Question. How can i fixed the following Problem. I show a Textfield when status has changed, but how can i proof that there is content in the new field wich is showing up. I want customers to have to write something in the textbox when it´s expand. Setting the Property in the Columnpoperty doesn´t do the Trick because it allways wants to be that there is Content in the field when clicking the OK- Button even when it is collapsed. This example looks at a Yes/No-field named “MyYesNoTriggerField”, and if it is checked, it looks if the fields specified in the array “arrToCheck” is filled (example uses a single line text field to check, you must adapt the code for radio button or other field types). If they are not, it gives an alert and interrupts the save process. Add this function to the script in the original post. It’s just not working for me. I think it may be that the jquery isn’t running, is there a way to test it? If this line gives no alert – jQuery is not loaded. Thanks…. This is working for me now. Always end up being (do I dare say it?) User Error. So now I need help again. I have the code running perfectly for one select and opens other fields but I need to have another field select to open hide/open other fields. Cant figure out how to code this. Pasted code into a CQWP and create fields as shown. Nothing happens! Tested jQuery and it is obviously loaded and working. Any idea why code does not work. Something missing? i have some problems with this script. it shows me nothing. Anny help on that? This is great post. Thank you Alexander. Has anyone been able to get the PreSaveAction function to work for radio buttons as the trigger? Great Code, this is really helping me build a great feedback form. A question though, is there anyway to sort the array alphabetically if I add a new item to the end of the array? I’d rather not have to rhift the numbers every time I add a new choice, thanks for your help! I’m not sure i understand this question – please clarify a bit more. Does that clarify things a little bit? The sorting is not altered in this script, it is the same sorting as the original choices configured when creating the field in the list settings. I guess it would be possible to rearrange the options without breaking the field, but I’m afraid i do not have the time to do that right now. Is there an easy way to incorporate this with the side by side script and toggle the fields aligned in a single row? I guess you will have to address the field with an extra “.parents(‘tr:first’)” to get the full row, but i have not had the time to test it. Using your code above to check for blank fields, how would I modify this to work with a Person or Group field? I’ve tried both input and select, input will always return the field as blank, select always sees the field as having data. Thanks, here’s the code. Can I tag the TR with an empty class just to identify it for the script? I have 30 of these rows and I want to hide them in groups of 5. Your solution helped me out with a WSS 3.0 solution i had to build for a customer. Now i’m migration to sharepoint foundation 2010. I’m trying to use your code in the new forms. Unfortunally it does not work. Is there a possibility to get your code running under SP 2010 ? I did a test in SP2010 and it does work without any modifications. Please check your setup. you’re absolutely right. it works fine with SP2010 forms. i tried it on a form which already had injected your code from “Cascading dropdowns in SharePoint text fields – populated by lookup in another list (version 2)”. combining these two scripts doesn’t seem to work. depending on how i arrange the CEWPs eather one or the other script works. is there a way to get both of your scripts running in one form ? There can be some difficulties because both the scripts hide and show fields. If the scripts refer the same fields, you may want to wrap the call to the “cascading dropdowns” in the “expand” function so that it is not called when the fields are supposed to be hidden. ive been running your script for some time and it worked perfectly. the users that had access to the list using it till now had rights to all intranet sites so far. Now i added some new users that only have access to this one list with add/remove/edit rights. i am using wss3.0 and have no idea why it doesnt work for those restricted users. if u know what could be the problem id really appreciate if you could give me some advice. I tried your code and it does not work. Do you see anything wrong here? I have data in my list and I have renamed most of the fields to match the code. Would this cause issues? slight variations, and as I said may be attributed to the blog post. This first this that comes to mind when I read “I have renamed most of the fields to match the code.” in your post is there is a difference in the DisplayName and the FieldInternalName (FIN). A’s script always uses the FIN. If you renamed your fields then you may not have the correct FIN. A has a post on how to find the FIN. I have found the most likely reason for script failure is me having the wrong FIN, The second is my source path. So, how do I find the correct FIN? Do you have the link to where A has a post on how to find this? Thanks so much! This site A has put together has many resources. It may take some time but if you look and read you will eventually find what your looking for. On is home page he has several links related to using this site and other references. If you go through this post it may help you to understand the FIN and also has a link to what your looking for. It is important you try to read most of the stuff on the home page. it has steps for troubleshooting and other impportant information. Awesome! Thanks so much! It works now. And Myselect have 6 different colors.For the above script is not working.Could you please help the required changes i have to do. I ran into issues where it did not work properly due to certain characters not added or added. You will need to review them carefully. Is there anyway we could add a second dropdown into this code? I have tried, but it did not work. Thanks. The function name for “dynamicDisplay” should be changed for the second instance to not interfere with the first. I tried duplicating and it’s creating the form to come up blank on load. I’ve tried your revised script to accommodate two drop-downs, but when I choose from the second drop-down, the fields expanded by the first drop-down are collapsed again. Any thoughts? Ensure the arrays have unique names. Look at line 12 and 55. Soooo weird. So, I took your code and created a new list with the field numbers as you have. I tested and it worked. Now, if I implement this to my edit form, it does not show the second colum if I add the field in the array nor it would work with any of the choices. Going to try again later! Alexander- that worked out perfectly, I seemed to have mis-named my arrays. Thanks for taking a look and for your help! should this function be a second one on line 78? Mine is still not working. No, this function is shared. Reading your previous comment, I guess you have one or more FieldInternalNames wrong. You are so right. Awesome! It worked like a charm. Thank you so much for your help and quick response. You are the best! Hi, can this be applied to a custom form? It works great when I use the default NewForm.aspx, etc. but I have created a New.aspx in order to add some functionality, but I cannot get this to work via CEWP or by putting the code on the page via Designer. Any thoughts? Disregard, I didn’t see there were older comments! I was able to figure it out and it made my day!!!!!! Hi, this script is fantastic. It works great in IE8 and IE9, but I am not able to get this working in any browser other than IE. Safari and Chrome simply will not hide the fields on either a Mac or PC. Any suggestions to make this work would be greatly appreciated. Great piece of code. Thanks!